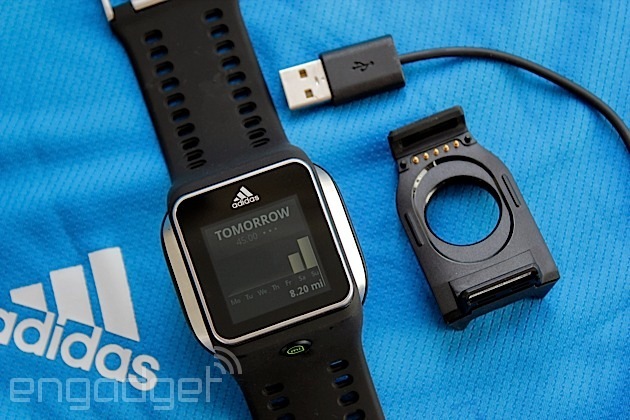 Be the first to review the miCoach Smart Run? The first time you switch the Smart Run on, it will ask you to hand over some information. The usual stuff: age, weight, height and so on. 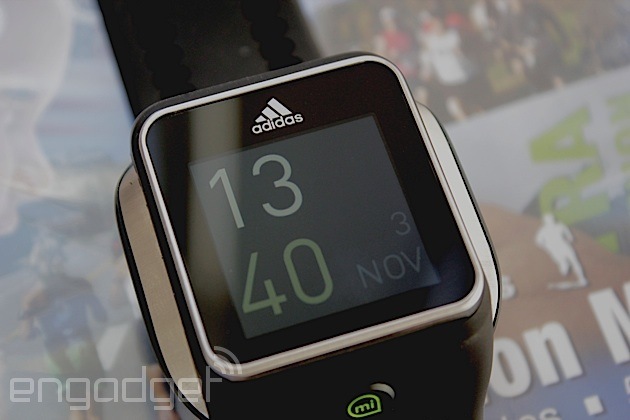 It will also want your miCoach credentials for syncing (so you'll need to register online if you didn't already). Adding this info is a bit of a challenge, with lots of swiping back and forth to find the right letter, then on to the next. But, once you're done, you won't need to do it ever again. 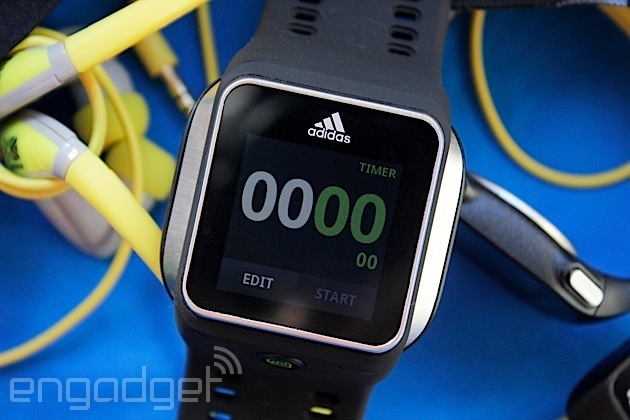 I already had an account with miCoach, but with no data, so it was effectively a clean start. I headed over to the online training plans and decided it'd be fun to run a marathon. So, I chose Adidas' plan for this, and downloaded it to the Smart Run. I went back to the watch and headed into the training settings, and there it was: today's run. It started things nice and easy with a 30-minute moderate trot out in the park (OK, it doesn't actually limit you to where you go). Next, I chose some suitably high-octane music, and then told the watch I was ready by pressing, "Get Ready." At that point two icons appeared: GPS and a heart. As mentioned above, it won't let you actually head off until it's locked onto a location, and found your pulse. The latter (reassuringly) appeared first, after about 20 seconds, with the GPS taking a little longer -- upwards of a minute. All told, that's about the same time as other GPS watches we've used. Similarly, it tended to be quicker the next time if you're in roughly the same location. With both of those good to go, it's off and out the door. Seconds in, I felt a small panic at not having my usual MP3 player in my pocket, connected over headphones, or my HRM strap. This quickly passed, as the voice coaching kicked in and told me my first instruction: to run, but in my pre-defined "Blue" (i.e., slow) zone. Ten minutes in and the watch vibrated, letting me know I was entering the next stage, which was also confirmed by the virtual coach in my ears. The same voice pops up every now and again to remind you to slow down/speed up as appropriate if you drift out of the right zone, or to simply remind you you're doing just fine. For those who prefer visual cues, the screen displays your pace or heart rate with a colored background to show the zone you're in, and another colored band to show your desired one. If you're on form, these will be the same color. I had things set up so that I could see my distance covered, current pace, total time and heart rate all on one screen. Things get a little crowded on the display this way, but once you're clear on which number is which (and don't confuse your pulse with your distance), then you can grab the vital stats with a quick flick of the wrist. The touchscreen is also responsive, which is, of course, very helpful. If you've ever used a touchscreen running watch (like Garmin's Forerunner 610) that isn't as responsive, you'll know how distracting this can be while on the move. The only niggles we found relate to music. First up, for my tastes at least, it wasn't nearly loud enough. Using the same headphones (a pair of excellent Sennheiser MM 450-Xs) with other media players, and the same song, made a significant difference. Secondly, on my first run with everything going (Bluetooth, heart-rate monitor, GPS, a training plan and voice coaching), the music broke up at times, particularly when the voice coach piped up. On later runs, it was less evident, and experiments with lower-bit rate MP3s (192 kbps) corrected the problem entirely. We mentioned this to our contacts at Adidas, who offered to take a look at our device, but we've been unable to reliably recreate the situation since. What do all those sensors do to the battery? The short answer is that they clobber it. The 410mAh cell just about lasted through a day's worth of use. That meant using it as my primary watch (it's comfortable enough for that), and going on one-hour-long training sessions with all the sensors firing. So, if you work out every day, and use the Smart Run as a main watch, you'll have a daily hunt for a power outlet. If, however, you only use it for training, you could possibly get two or three sessions out of it. But, as we found out, it's equally important to recharge your headphones. If music is a key part of your exercise routine, and you're used to wired cans, this might be something you initially overlook. As I found on my second run, when the tunes faded away just one mile in, a dead battery can be spirit-crushing. On the plus side, the Smart Run's battery charges from zero to full in about an hour, so even if it's dead, if you can hold off for 15 minutes, you can likely sneak in enough juice to see you through. Also, once you've crossed the 30 percent threshold, the watch gives you plenty of warning that it might be running out. Still, that's only helpful if you have the proprietary charging cradle it comes with. Take good care of it though, because should you lose it, you'll be stuffed. 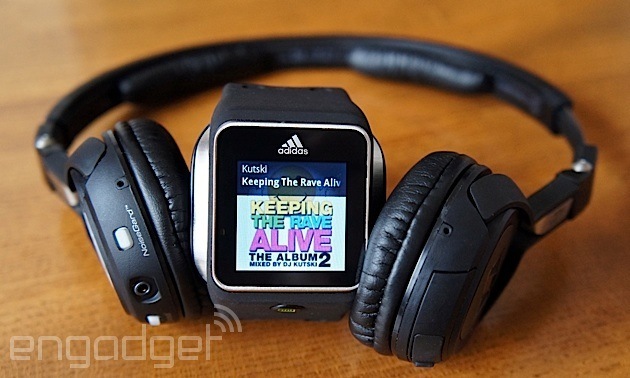 At the top of this review we alluded to the Samsung Galaxy Gear ($299) and Sony SmartWatch 2 ($199). 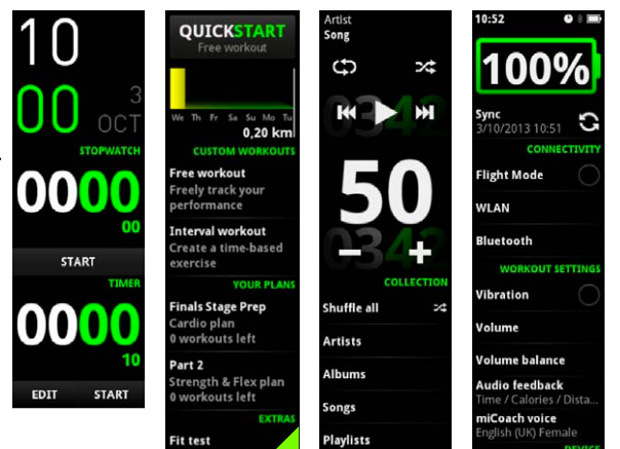 These are both Android watches, with some fitness features. 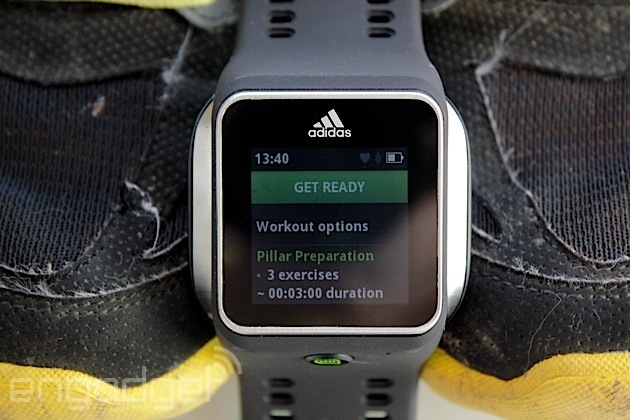 The Galaxy Gear has a pedometer that can sync with S Health on a compatible Samsung phone, and one of the SmartWatch 2's flagship apps (it comes with it free) is Runtastic. Needless to say, though, in terms of raw features and functionality, the Smart Run leaves both in the dust -- and that's even for casual athletes. 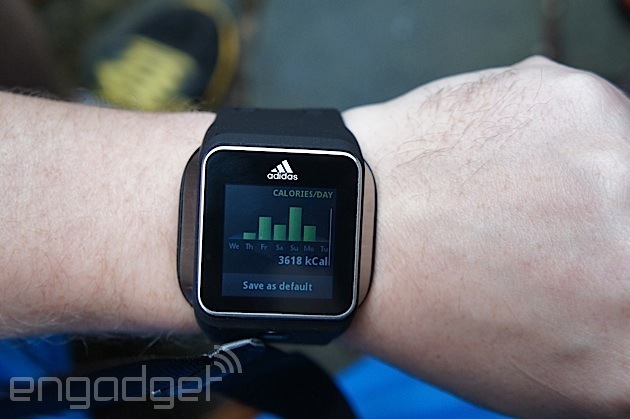 What about the Nike FuelBand SE we mentioned earlier? Well, even Adidas (and especially Nike) would consider that an unfair comparison (we mentioned it because the two products came out around the same time). Nike's $149 fitness tracker is a different prospect, aimed at those who want to generally get moving a bit more. Meaning, it's not something meant to get you race-ready. Nike's $170 SportWatch is a lot closer, but like most others (the $400 Garmin Forerunner 620, the $200 TomTom Runner, et cetera) it makes a worthy GPS-tracking device, and has some training features, but no media player or visual and audio training aides. Usually this comes with a lower price tag (Nike, TomTom), but not always (we're looking at you, Garmin). 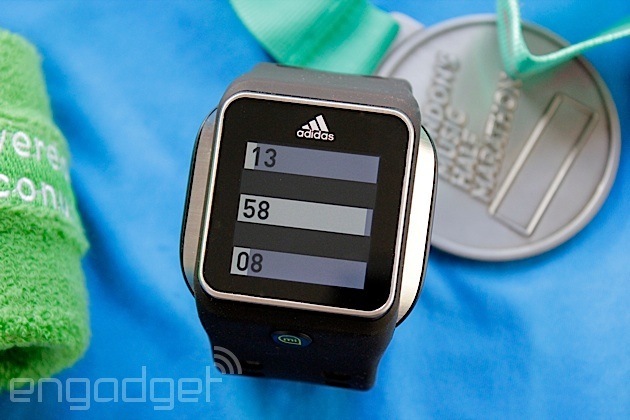 With the Smart Run, Adidas has pulled off quite a feat. If you've been longing for an all-in-one sports watch, media device, training coach, GPS tracker and heart-rate monitor, then this is it. The training plans avoid being gimmicky by adding real value, and the audio feedback certainly adds something to the experience. The media player had a few hiccups at first, but that seems to have been beginner's bad luck. However the music player really needs to go a bit louder, and please, please let us export our running data. Even more than that, it's the limited battery life that's most likely to turn off potential buyers. If you're used to charging your mobile devices every day, and can remember to charge one more, then you'll be fine. If the prospect of constantly feeding it turns you off, though, then you might want to consider one of the less power-intensive options mentioned in the "Competition" section above, or hold out in the hope a software update improves things. But, if you can live with the limited endurance, and are less concerned about the music and data, then the Smart Run really is a fantastic training companion.